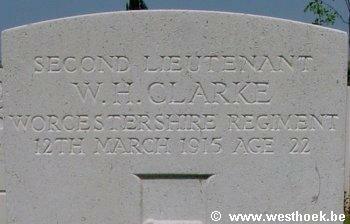 Second Lieutenant WILLIAM HAMILTON CLARKE "A" Coy. 3rd Bn., Worcestershire Regiment who died on Friday 12 March 1915. Age 22. 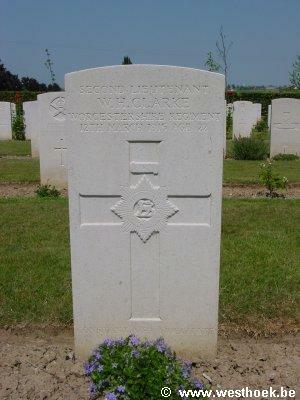 Second Lieutenant WILLIAM HAMILTON CLARKE "A" Coy. 3rd Bn., Worcestershire Regiment who died on Friday 12 March 1915. Age 22. Son of Lt. Col. Sir Edward Henry St. Lawrence Clarke, Bart., C.M.G., D.S.O., of The Hyde, Bridport, Dorset. KEMMEL CHATEAU MILITARY CEMETERY Row X. 13.